Recently, the pupils’ guides of the VS Bruce received new equipment, which financed the traffic watch. Last year in December some students of the VS Bruce took the exam for bus or pupil pilots. Their instructor, police chief Stefan Hannibal, noticed that the Bruckner pilots would need new safety equipment. It is recommended that the clothes be reflective fabric. Josef Fischer, Deputy Chairman of the Bruckner Wehrmacht, commissioned Hannibal to do everything necessary and promised that the Wehrmacht will bear the costs. 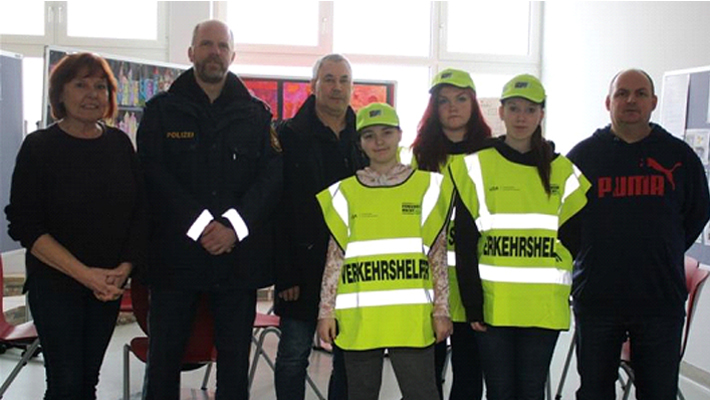 Recently, the first pieces of clothing were handed over to the traffic educator of the school, Michael Jagger. Three school pilot tried on the new safety vests and the captains and were immediately enthusiastic. The reflective tapes run vertically in this west, so that they can still be seen, even if the pilots have to bend over. The material is very strong and above all water repellent. Now only the jackets that have been ordered are missing, then the pilots can do their job dry and above all safe even in rain and snow. At the handover, Fischer promised that the Bruckner Wehrmacht will continue to listen to the needs of the student pilots.